Among all the features on Android Jelly Bean, the one which grabs our attention is "Google Now". 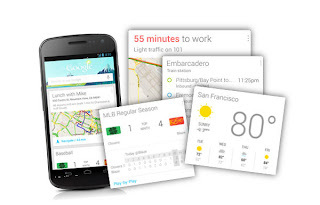 Google Now is a personal assistant (like Siri) and was even awarded as "Innovation of the Year" for 2012 by Popular Science. And after its huge success it seems Google is planning to launch it on their world famous browser, Google Chrome. No official announcement as of now, but new additions to chromium suggest its not far enough Google Now becomes a part of our browsing experience. There's no doubt that Chrome has made its place on top of every browser out there in a very short span of time. Google is currently working on a Chromium project code named "Show Google Now Notifications in Chrome" giving us some hints about what they are planning. We have also heard about "Creating a skeleton for Google Now for Chrome implementation", which is also a kind of indication about their future implementation plans on Chrome browser. Bringing Out Google Now for Chrome Browser will surely be beneficial for both Google as well as the users. We are looking forward for an official confirmation from Google.